Under the Presidency of Dr Quoc Do, a senior consultant from Frazer-Nash's Adelaide office in Australia, the Systems Engineering Society of Australia (SESA) has been awarded the International Council on Systems Engineering's (INCOSE) Gold Circle Chapter award. 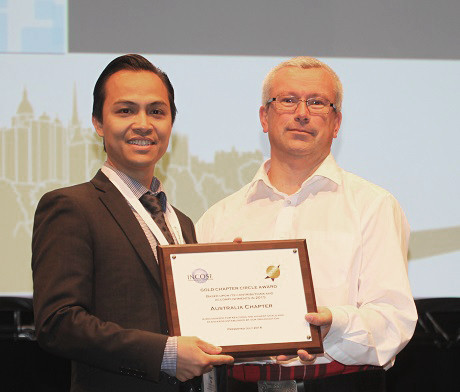 The award was presented to SESA, the Australian-affiliated chapter of INCOSE, at its International Symposium, which took place in Edinburgh, Scotland, from 18 to 21 July. Quoc said: "I am thrilled that SESA has received the Gold Circle award, as it shows the value that INCOSE places on our members' commitment to improving the recognition of the systems engineering profession, and to sharing, promoting and advancing the best of systems engineering in Australia. "It also recognises SESA's progress, building on previous Silver Circle awards in recent years. I am particularly pleased to have achieved the Gold Circle award this year, which will coincide with the end of my term as President." "I am grateful for the support of my employer, Frazer-Nash Consultancy, which has enabled me to attend key SESA and INCOSE events, and to fulfil my SESA commitments." The INCOSE awards programme, which has Gold, Silver and Bronze Circle levels, recognises chapters that meet and exceed INCOSE's standards for local service and contributions. They are awarded to chapters that strive to enrich, educate, and enlighten their membership, through professional and social programmes, membership recruitment and retention drives, and technical activities.